Six-time champion Roger Federer defeated Novak Djokovic 7-5, 6-2 in round-robin action on Tuesday at the ATP World Tour Finals. Federer’s straight-sets victory, coupled with Kei Nishikori’s three-set 7-5, 3-6, 6-3 decision over Tomas Berdych, means he has qualified for the Group Stan Smith semi-finals. The Swiss broke their ATP Head to Head deadlock and moved ahead 22-21 with the victory. Djokovic, who tied the series with a four-set win in the 2015 US Open final, has never had more victories than Federer in their rivalry, which dates back to Monte Carlo Masters in 2006. Both players looked sharp early on, especially on serve, but Federer seized the momentum, taking the opening set 7-5 in 44 minutes. He would keep rolling in the second set, totaling 19 winners and a like number of unforced errors in closing out the match in one hour and 17 minutes. “You have those days as well when you're not feeling your best - not even close to the best,” said Djokovic, the reigning three-time champion. “Credit to Roger for mixing up the pace, giving me always a different ball. He used the slice and spin very wisely. He served very efficiently. I made a lot of unforced errors . Just handed him the win, especially in the second set. If you play this way against Roger, you have no chance. 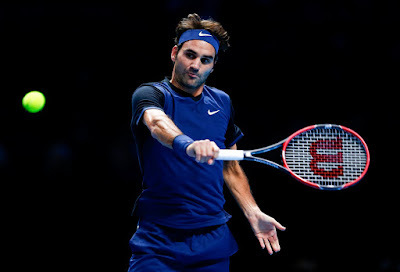 Federer won 75 per cent (27 of 36) of his first-serve points, and converted four of eight break-point opportunities. Djokovic had been riding a 23-match win streak since falling to Federer in the Cincinnati final on Aug. 23. He had won 15 straight matches at the ATP World Tour Finals, including wins over Federer in 2012, 2013 and 2014 (walkover). The rivals have met more times (43) than any other two players in the Open Era with the exception of Djokovic and Rafael Nadal (45). The pair’s respective coaches, Hall of Famers Stefan Edberg and Boris Becker, played 35 times.